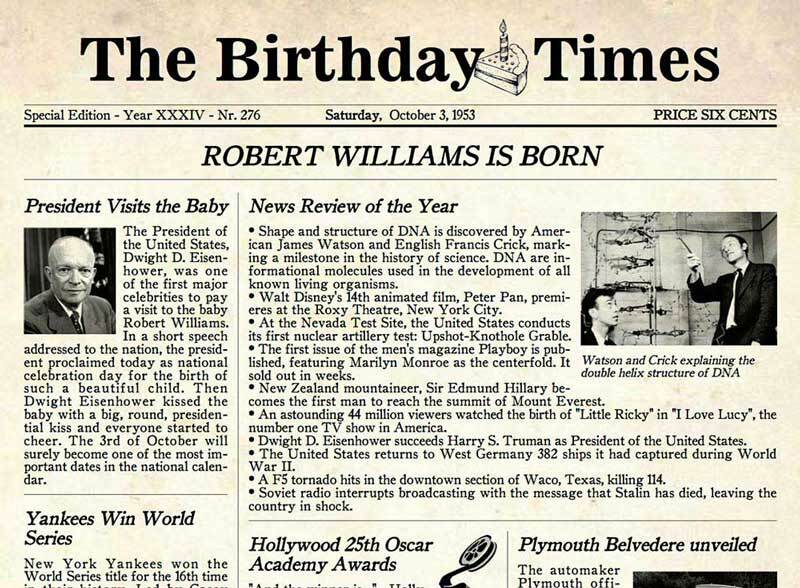 Personalized newspaper front page with real events and news of your birthday. The perfect gift for yourself, your friends and family! Click on the Ad to change it. The image above is a low quality preview of a high-resolution document. Please complete the form above and preview your birthday newspaper. Get this document as a high-resolution PDF file. Make just one purchase and print it out as many times as you like. Printed on high quality off-white letter-sized paper giving it the perfect aged look. You will still receive the PDF by email. More info below. Keepsake that you will treasure for many years to come. You can order any newspaper front page as a high-resolution PDF file, that can be printed on letter-sized paper. Make just one purchase and print it out as many times as you like. Pay with PayPal and receive it within minutes. View Samples What is a PDF? You can also order it printed, on high quality off-white letter-sized paper giving it the perfect aged look, and have it mailed to you (dispatched in two business days). You will still receive the electronic edition in PDF by email. Please contact us to receive quantity discount pricing (PDF or Printed option). A great way to personalize your next meeting, event or special occasion. 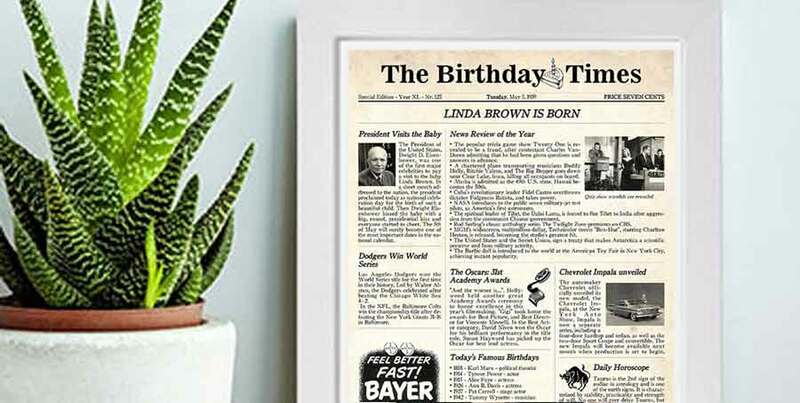 Give your employees, clients, and customers the recognition they deserve with a personalized copy of The Birthday Times. 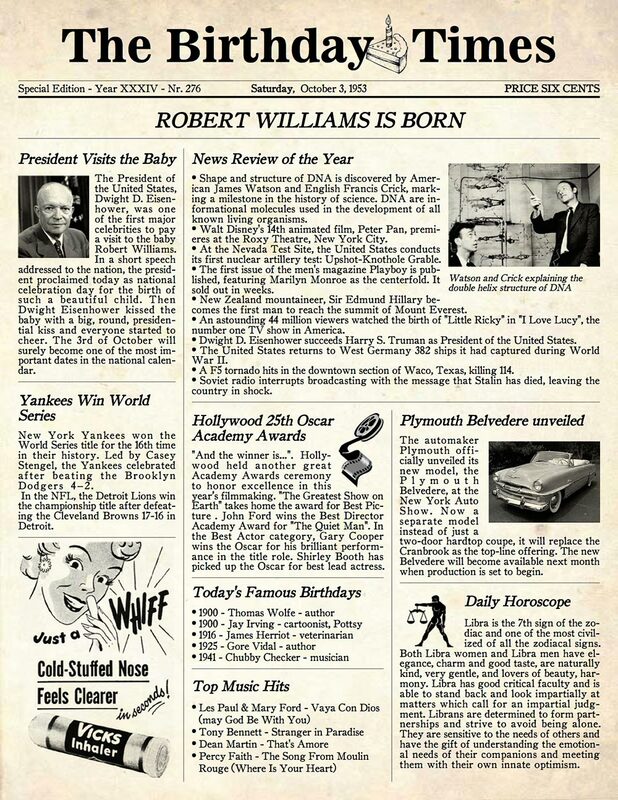 Each newspaper features a vintage ad from the time period. You will realize that advertising is an interesting and fun way to look at a specific point in history. PDF (Portable Document Format) is a file format that captures all the elements of a printed document as an electronic image that you can view, navigate, print, or forward to someone else. To view and use PDF files you need the free Acrobat Reader, which you can easily download. Download a free high resolution sample in PDF or the screenshot from the same document in JPG format. This is a fun and easy (and affordable) birthday gift. I gave two and both recipients loved it. The personalized birthday page was a big hit. Was just what I wanted. Fair priced. I ordered this as a special momento for my son's 21st Birthday and he thought it was so cool. I will definitely order again! The personalized front page was a lot of fun at the birthday party. What a great thing to give to someone who's hard to buy for - and if they're even slightly interested in history, the entire paper-of-their-day is an unusual gift. Used the newspaper for my best friends 50th birthday yacht cruise. Everyone enjoyed reading the interesting facts and going back down memory lane. We had such a good time going over the facts and information. Our Grandfather has everything and this was a way for us to share with him on his birthday. This Birthday Newspaper was an absolute hit at my God Mothers 76th Birthday party! Gave the newspaper front to my sister in law for her 70th birthday. She loved it so much and it now is framed and on her living room wall for all to see. Please complete the form and we'll get back to you as soon as possible. In alternative you can send us an email directly to the email address info@thebirthdaytimes.com. You have successfully submitted your message. Our support team will be in touch with you soon. Please try again later. We're sorry for the inconvenience.